Swain County is located in the mountains of western North Carolina, along the Tennessee border. The county was named for David Lowry Swain, who served as governor of North Carolina from 1832 to 1835. The county seat is Bryson City. As of 2010, the county’s population was quite small at 13,981 people. The Nantahala River runs through the county; Swain is one of the premier whitewater rafting destinations in the state. On the eastern half of the county there is an Eastern Band Cherokee Indian reservation, the Qualla Boundary. The Great Smoky Mountains are also a prominent landscape feature. The natural mountain beauty makes tourism Swain County’s top industry. Swain used to be among the more Democratic counties in North Carolina. Democrats still maintain a hold on the County Commission. But in presidential and other federal elections, Swain County has shifted sharply to the right, thanks to growing discontent with Democrats from working-class whites. Despite a strong Democratic faction, Swain County has not gone for Democrats in a presidential election since Bill Clinton in 1996. In 2012 Mitt Romney carried Swain 52%-46% over Barack Obama, slightly worse than Pat McCrory’s 52%-45% victory over Walter Dalton. 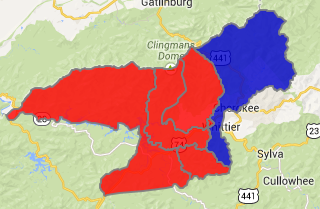 Forecast: Swain County is one of those areas where Barack Obama was a poor fit. Someone like Hillary Clinton would probably do much better here, and might even win it. There is a large Democratic base but they tend to be more conservative and are skeptical of “liberal elites”. The growth rate during the 2000s decade was 7.81%, below average. Besides Hispanics, most of the growth comes from whites. There has possibly been an influx of retirees who have come to enjoy the mountain scenery. Looking forward, the growth rate here will continue to lag behind North Carolina and the nation. For Democrats to win back Swain County, they need a Democrat with a moderate profile who can appeal to disenchanted white working-class voters. Swain’s population, though, is much too small to render it of much importance in state politics.